← Legacy of Poetry: Poetry on the Move! 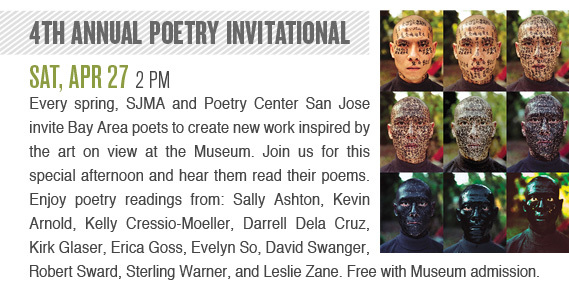 Don’t miss this annual Santa Clara County Poet Laureate event sponsored by the San Jose Museum of Art and Poetry Center San Jose. Santa Clara County’s first Laureate, Nils Peterson, began the tradition. I will be this year’s host once more. Come early and enjoy the museum’s current exhibits, then listen to a selection of poems read that were written by area poets in response to these pieces. There may still be space in the morning workshop at the museum so that you can try your hand at writing an ekphrastic poem, too. Looking forward to this, Sally. Cannot make your morning workshop, but have recommended it to friends and students. See you at 2 for this always wonderful reading. I’m looking forward to seeing you there, Parthenia! Thanks for your support.